According to statistics published by Google as part of its Android Developer Dashboard, Nougat has finally become the most-used version of Android, exactly a year and a half after it was officially released by the tech giant in August, 2016. Between versions 7.0 and 7.1, Nougat has 28.5 percent of the overall Android pie, while Oreo (8.0 and 8.1 combined) still has only 1.1 percent share of the market. What’s interesting is that even Jelly Bean (versions 4.1, 4.2 and 4.3 combined) has a higher overall market share than Oreo with 5.5 percent of the market, which should be disconcerting to every Android user everywhere. Meanwhile, Marshmallow fell 0.5 percentage points to hit 28.1%, while Lollipop (versions 5.0 and 5.1) accounts for 24.6% and KitKat is at 12.0%. 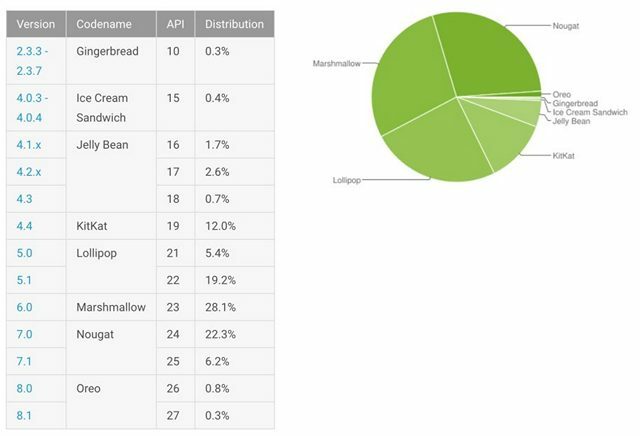 What’s interesting is that 0.3 percent of all users are still using ancient smartphones running Android Gingerbread (version 2.3), while 0.4 percent users are still holding on to their devices running Ice Cream Sandwich (version 4.0). It’s worth noting here that the data relates to all users who visited the Play Store during a 7-day period ending on February 5, 2018. With fragmentation continuing to remain a massive problem with Android, Google introduced Project Treble last year in order to speed up the process of OS updates. However, only devices that ship with Android Oreo are required to include support for the platform, and most manufacturers are just not shipping their smartphones and tablets with Oreo yet. It will be interesting to see if Google can effectively push its OEM partners to rollout updates in a relatively more timely manner, but till such time, fragmentation will likely continue to remain the bugbear of the Android eco-system, whether we like it or not.